Mercedes Taxi Service in Sevilla Area, Airports and Hotels. Taxi Mercedes Sevilla offers you a solution for all your travels in Sevilla, Transfer airport and travel throughout Spain and Portugal. Taxi Sevilla Mercedes guarantees a timely and quality service. Taxi Mercedes Sevilla offers the best cars at the same price as a conventional Taxi. We provide services to citizens, businesses and institutions. 365 days a year, 24 hours a day. Our experience makes us the most experienced company in the sector at your service. All vehicles are new and are equipped with GPS to ensure timeliness and efficiency of service. You can also have WIFI during travel to your destination. We have a staff of experienced drivers. TRANSFER Services in Seville Airport. Collection Service in Seville Airport Personnel waiting at the door to finish out with Indicative poster with your name or the logo of your company. If you want you can hire your Taxi Mercedes equipped with baby seat / child, do not forget to indicate the age / is the child / a in question to adapt the service to your needs. We operate 24 hours a day, 7 days a week. For more information or to book, please call +34 669 202 136. You can also fill out the contact form, we will respond as soon as possible. Taxi Sevilla, all our clients, whether individuals or companies, receive VIP service. Weddings, meetings, parties, please contact us and we will help you organize transfers for your special occasion. Transfer at airports and travel throughout Spain and Portugal. Taxi Sevilla Mercedes guarantees a timely and quality service. All vehicles are new and are all equipped with GPS to ensure timeliness and efficiency of service. 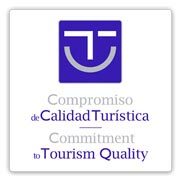 It is a project to improve the quality of tourist destinations promoted by the Tourism Institute of Spain ( TURESPAÑA ) and the Spanish Federation of Municipalities and Provinces (FEMP ), which works with companies / tourist services to 30 different trades , with the ultimate goal of improving the experience and satisfaction of tourists .